The world is coming to an end. Okay, that’s not happening “really” any time soon, but we can’t seem to escape from that circle of thought. Pollution levels are rising (Hello #DelhiSmog), heavy rains are killing people (how are you doing Chennai? ), mass shootings (give my regards to your country, Trump) and whatnot. Difficult times do bring people and ideas together. We have seen that during the 2015 Chennai floods. Thoughts and prayers and social media hashtags poured in within minutes of a calamity. However, is that enough? Do we have to lose more lives to learn? Or, can we take steps to keep the managers of tragedy away? But when all else fails, cinema comes to the rescue. This time, it’s from the apocalypse/disaster genre (to soothe our burning senses). Here’s our top picks of films to watch in these trying times. Danny Boyle’s (best known for directing the Academy Award winning movie Slumdog Millionaire) 28 Days Later will certainly take your breath away. The movie starts off with the introduction of a chimpanzee being released by a group of animal rights activists. The chimpanzee attacks the activist who freed it and that’s when all hell breaks loose. 28 days later, a man wakes up in a hospital and realises that the world has changed in a matter of few weeks. He tries to keep himself alive with the help of survivors he meets on the way. 28 Days Later shows why women aren’t safe even in the time of a tragedy. Beast-like men don’t have second thoughts while preying on women. 28 Weeks Later is similar, in terms of shock value, to its mother film, 28 Days Later. Yet, the basic line of the story takes off from a different station. The film is centered on a family of four (husband, wife, and two children). The husband runs away from a pack of zombies and leaves his wife behind. But, to save his face, he lies to his kids. When truth eventually shows up, the kids start to accept facts as they come. While the husband doesn’t go back to help his wife when she’s getting attacked, the kids stay together no matter what. The Road is based on the novel of the same by Cormac McCarthy. In this movie, a father and son carry a revolver in case worse comes to worst. Cannibalism is no more frowned upon as that’s how powerful people live. It’s a poignant movie that speaks of the strength of endurance by commenting on how one has to carry the fire inside them to overcome hardships. The movie is coloured by shades of grey. It means that there’s bleakness in what we’re seeing and what the characters are going through. Isn’t it sad when a young boy wishes he were dead? The Road takes you through roads of desperation and hope poetically, and it slows the heart rate of the viewers by silently touching on the importance of moving on. The Book of Eli has some terrific action choreography. Denzel Washington stars as Eli who’s going in search of a particular place. Like The Road, this movie, too, is colored by shades of grey. Washington is sure about every move he makes as he relies on his superpower – smelling. In one of the early scenes, he sniffs out a gang of thieves and kills them one after another. “What does the book in The Book of Eli symbolize?” you might wonder. The book’s captivating power is the the essence of this Washington-starrer, after all. The rich plan to keep the poor and the weak under their control through the words of a sacred book. 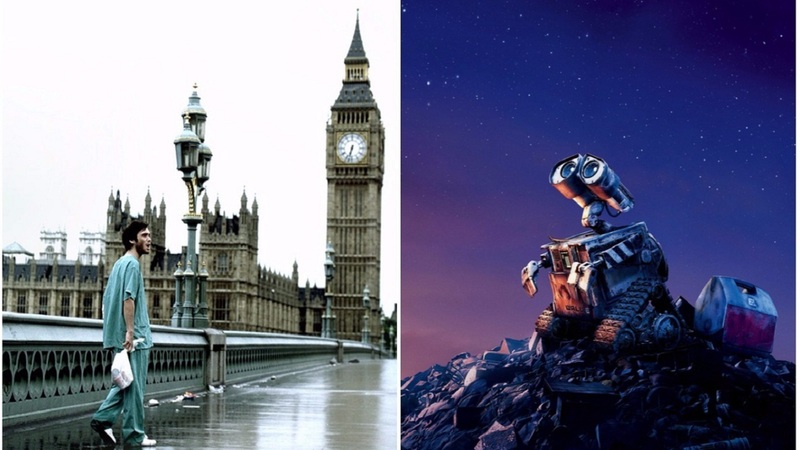 WALL-E might appear like a romantic film in parts (which it is). Nevertheless, it’s actually a movie that talks about the dangers of human behavior. We dump every little thing on the streets these days. Also, we have no respect for recycling. What’s going to happen to all that waste? Don’t you think they’ll come to back to haunt us? WALL-E is a rare film that acts cute on the outside by making two robots fall in love with each other. On the inside, though, it’s a solid feature that slaps the viewers’ conscience for letting the Earth rot. These films may be in the science fiction, horror, and animated realm today, but it won’t take too long for fiction to turn into reality. Dear universe, I hope you prove me wrong.